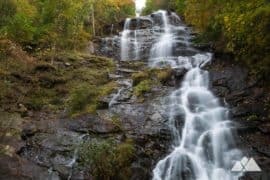 Hike to exceptional summit views on our favorite trails to the tallest mountains in Georgia, scaling lofty peaks and summits to catch some of the Peach State’s best views. 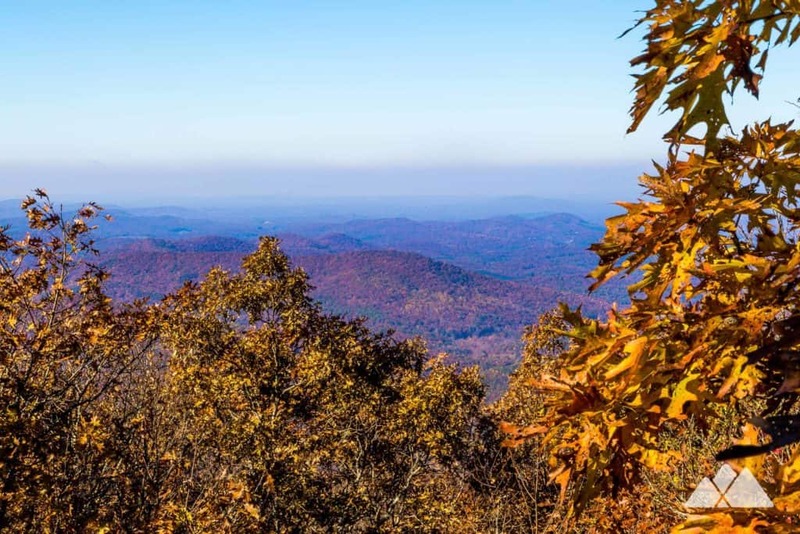 From the lofty peaks of Brasstown Bald and Rabun Bald to the rolling landscape of Arabia and the rocky ridgeline of Pine Mountain, Georgia’s mountains offer prime opportunities to catch some stunning summit views. North Georgia’s Southern Appalachians are home to the state’s tallest peaks, with more than 20 summits towering to elevations above 4000 feet. 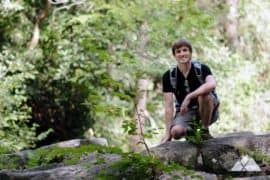 And while they weren’t quite tall enough to make this list, several rocky peaks in the Atlanta area make for a fantastic summit hike, too. 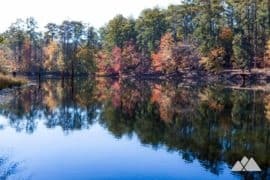 The monadnock mountains of Arabia, Panola, and Stone Mountain rise above the rolling landscape east of downtown Atlanta and offer gorgeous views from their rocky, expansive domes. 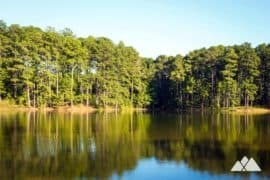 And only an hour south of Atlanta, Pine Mountain towers above the plains near Columbus, providing sweeping views of field, lakes, and forest. It’s no matter if a mountain crests at 1000 feet or 5000 feet: there’s something intensely gratifying about summiting a final stretch of rugged trail and then catching a stunning summit view. Maybe it’s the satisfaction of finishing a great workout (and knowing that it’s all downhill from there). Or maybe it’s the change of perspective, the chance to gaze on the world below in awe. Whatever it is, it’s addicting. 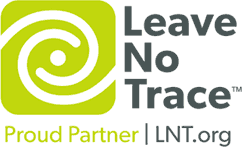 Ready to chase a mountain adventure? 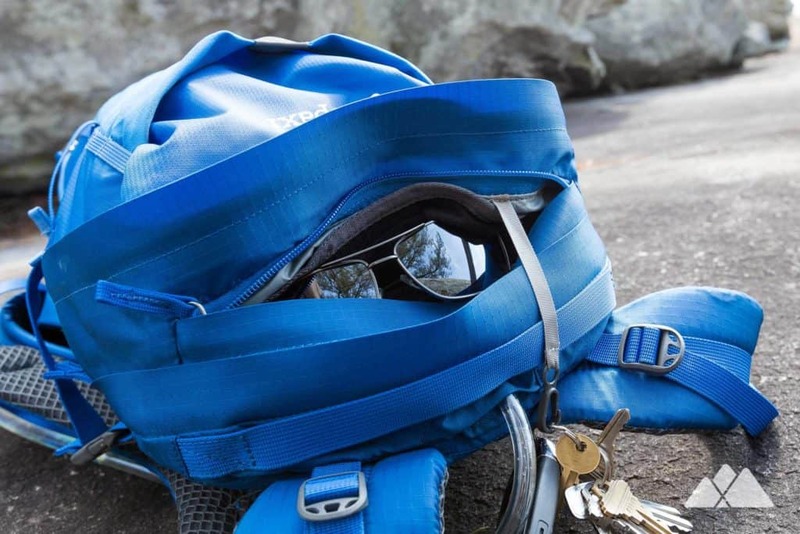 Get mountain ready (without actually spending time in the mountains!) 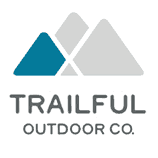 with our hiking and trail running mountain training guide. 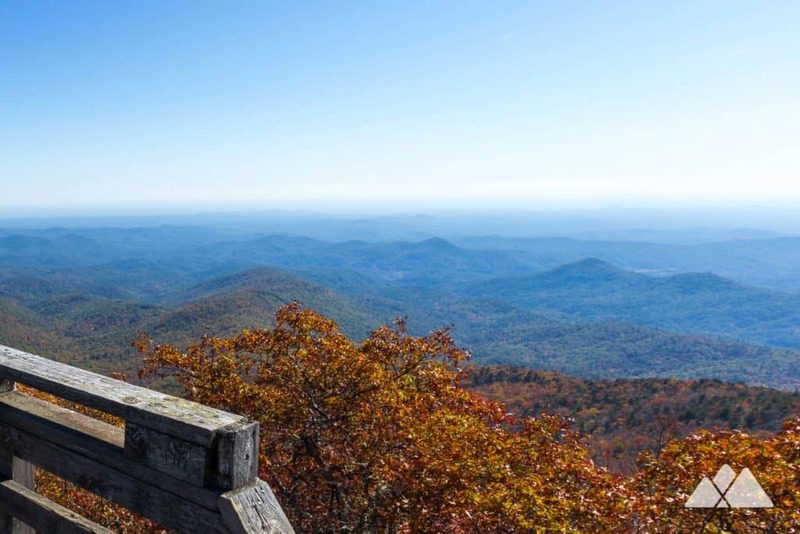 If you’re up for a road trip, explore some of the South’s most stunning mountaintop views on our favorite Blue Ridge Parkway hikes near Asheville, NC, climbing to the grassy summits of 6,000+ foot mountain balds with 360-degree summit views. 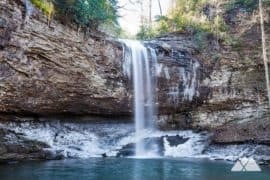 And, once you’ve conquered our Georgia mountain bucket list, take the plunge and explore Georgia canyons on our favorite hikes through some of our state’s most spectacular places below. Brasstown Bald is the highest natural point in Georgia, and it offers some exceptional panoramas from its lofty summit. 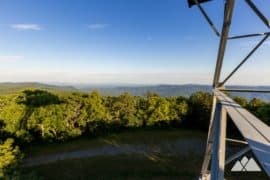 Climb a short mile to the old wooden fire lookout tower on the mountaintop to score 360-degree views. 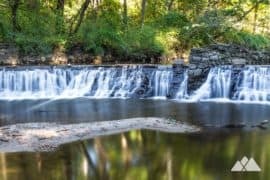 Or hike an eleven-mile roundtrip on the Arkaquah Trail from the near-summit, following a lofty ridgeline before descending to explore ancient petroglyphs at Track Rock Gap. It’s a tough hike, but incredibly scenic. 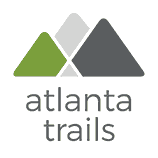 Hike Georgia’s second tallest summit for outstanding 360-degree views of the surrounding peaks and valleys. 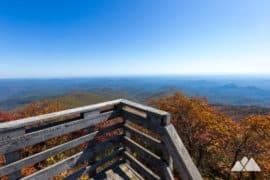 There’s a wooden viewing platform at the summit, the remnants of an old fire tower, that’s perfect for soaking in the view. 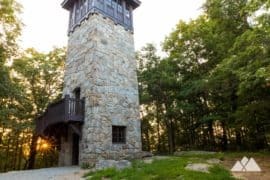 Hike Georgia’s tallest peak on the Appalachian Trail, and visit an AT shelter built in 1934 near the rocky summit. 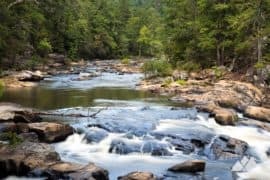 It’s one of North Georgia’s most popular hiking and backpacking destinations, and for a good reason: the views are sublime, and the rocky climb to the summit is a great workout. Hike a 5 mile stretch of the Appalachian Trail from Indian Grave Gap to Tray’s summit. 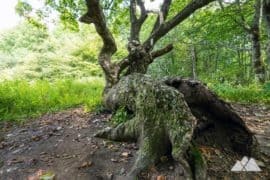 Explore mossy valley terrain and duck through dense tunnels of rhododendron before reaching the summit, and catch gorgeous views from both sides of the trail. 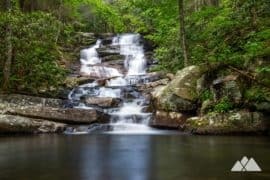 Hike from Lake Winfield Scott through the beautiful Blood Mountain Wilderness on this 5.6 miler. The hike travels the lower elevations of Slaughter Mountain, trekking through terrain covered in wildflowers in early spring. Hike one of the most challenging sections of the Appalachian Trail in Georgia from Unicoi Gap to Rocky Mountain. 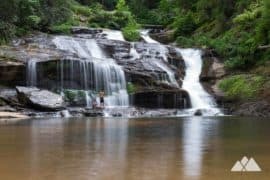 The hike meanders through switchbacks, summits to lofty views at Rocky’s peak, and then dips into a fern and wildflower-filled gap. 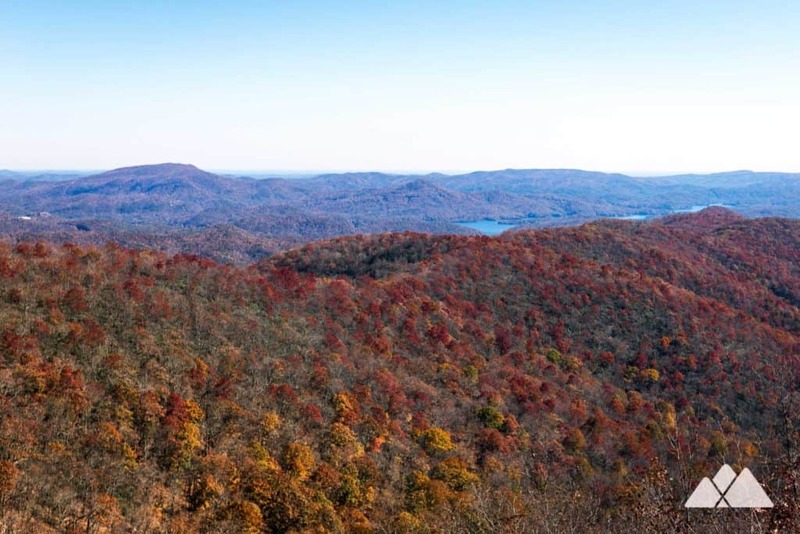 Hike the AT south from Dicks Creek Gap to a sun-soaked summit. The adventure catches spectacular views of the surrounding North Georgia mountains and glimpses of Lake Burton. 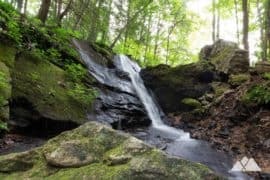 Hike the Appalachian Trail from Tesnatee Gap to Cowrock Mountain, packing in a whole lot of visual punch into a relatively short 2 miles. Rolling, blue-green hued peaks, vast open vistas, ferny, shady forest, and views of the Raven Cliff Wilderness are just a few of the sublime sights on this hike. 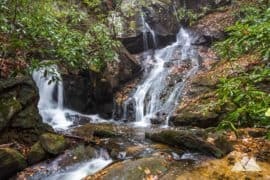 Springer’s rocky slopes and rhododendron-filled forests give way to some stunning summit views at the southern start of the Appalachian Trail. 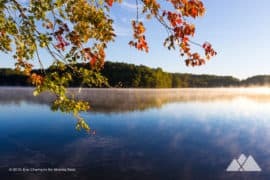 Hike to the AT’s final blaze on the Springer summit via the AT Approach Trail, the Appalachian Trail or Benton MacKaye Trail… or all three to explore Springer’s exceptional beauty. 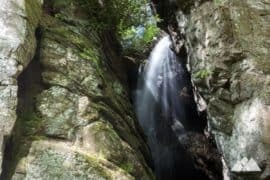 Hike the Appalachian Trail from Woody Gap to Big Cedar Mountain, catching beautiful summit views of the Blood Mountain Wilderness from the so-called ‘Preacher’s Rock.’ And for a longer adventure, continue the trek through lush Georgia forest to Jarrard Gap near Blood Mountain for an 11.6-mile round trip. Hike the Grassy Mountain Tower Trail to a historic steel fire tower on this soaring summit. 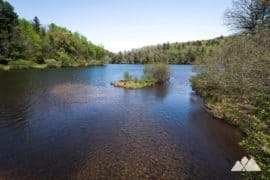 The hike climbs from the shores of Lake Conasauga, the highest-elevation lake in Georgia, ascending through a scenic forest and passing a grassy marsh. 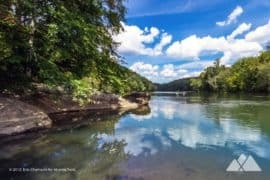 Hike the Tennessee Rock Trail at Black Rock Mountain State Park, and catch beautiful vistas from some of the highest elevations in Georgia. 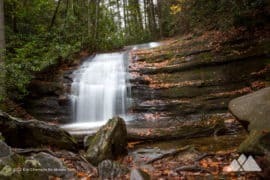 In springtime, trilliums and other native Georgia wildflowers blanket the forest floor, and the mountain’s overlooks reveal long-range, colorful leaf views in autumn. Hike the Appalachian Trail to Ramrock’s summit, and catch exceptional views from the Woody Gap trailhead before the hike even begins. This popular AT day hike explores several scenic views along a ridge and visits the Gooch Mountain Shelter on the way. 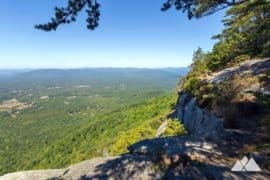 Hike the Yonah Trail near Helen to some pretty spectacular views. The hike is far from easy, but the view of rolling forest and farmland from the summit makes the workout worthwhile. 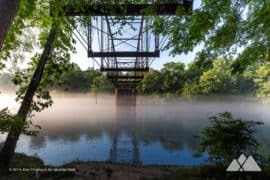 Hike Fort Mountain State Park, one of Georgia’s highest elevation state parks, to a historic stone fire tower, a mysterious and ancient serpentine stone wall, waterfalls and stunning overlooks with see-forever views. 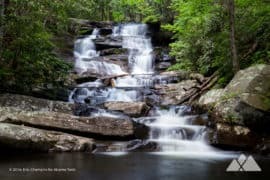 Hike Amicalola Mountain to Georgia’s tallest waterfall, Amicalola Falls. 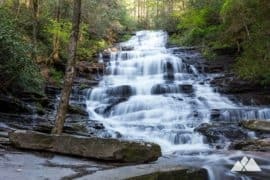 Hike a loop to take in the towering falls from a series of stairs and bridges, and climb to the waterfall’s crest to catch some stunning long range views into the Chattahoochee National Forest. 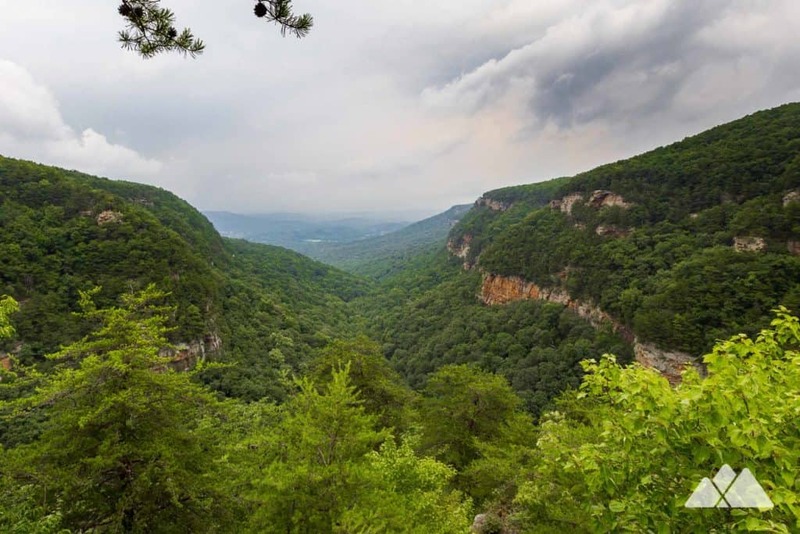 Hike the West Rim Loop at Cloudland Canyon on Lookout Mountain, and enjoy incredible vistas of the canyon walls and forest below. 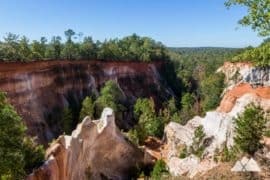 Then drop from Lookout’s ridgeline into the canyon’s shady depths, and visit the park’s beautiful, tumbling waterfalls in the deep-cut gorge below. 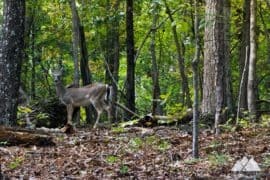 Hike the Indian Seats Trail to catch expansive, long-range views of the rolling hills and the North Georgia Appalachians. 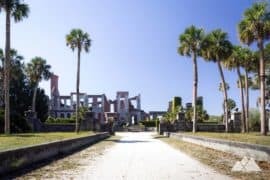 It’s an ultra-scenic (and extremely popular) trail, but please leave your four-legged hiking buddy at home: dogs aren’t allowed in the preserve. Hike this rocky peak near Atlanta through rolling forest, the site of a Civil War battle. 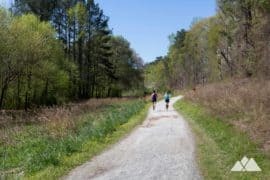 Summit Kennesaw to take in beautiful views amidst Civil War cannon and earthworks, and catch views of the Atlanta skyline far on the horizon. 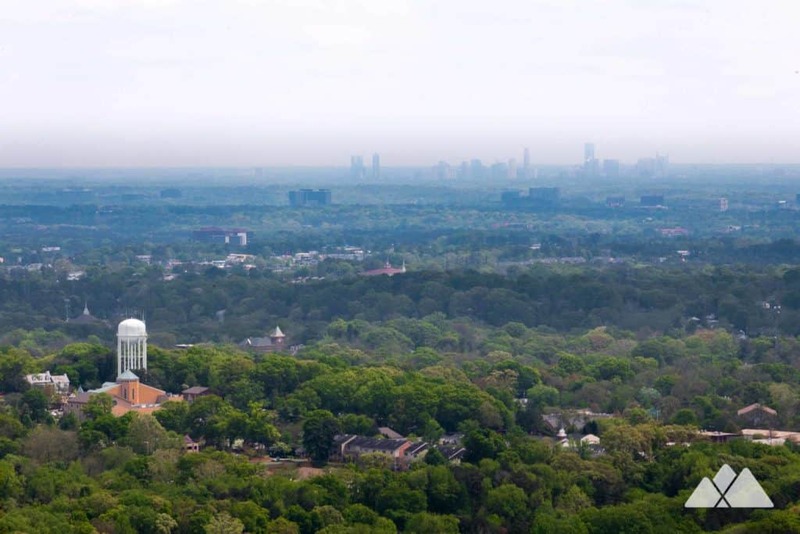 Summit Atlanta’s nearby Stone Mountain for breathtaking views from the top of this iconic monolith, and catch stunning sunrises, sunsets and skyline views from the summit’s wide, breezy expanses.